This page is a text version of the Forest to Field History Book. You can purchase a PDF copy of the book in our online store. The PDF copy is an exact page by page representation of the original book. This text version has been reformated for the web and contains text recognition mistakes. These mistakes do not appear in the purchased version. The purchased version also includes each image in the original book. celebrated their 50th Wedding Anniversary. Paul passed away in May 1983. Albin Martin was born May 3, 1904, attended Tales school. After quitting school, he helped on the family farm and worked at various jobs in the area as a farm worker, carpenter and trucker. On June 19, 1937, Albin married Lilly North. They were faithful members of the Danvers Lutheran Church and took an active roll in all activities there. Albin's farm was the N.E. 33-17-18W where he and Lilly resided until their retirement. During those years he continued to farm and work at his other jobs including caretaker at the skating rink. Lilly worked at the office of the Rural Municipality of Clanwilliam and also at the Riding Mountain National Park Ad­ ministration Office and retired from there in 1972. They spent the next winter in Surrey, B.C. In October 1973, they moved to Brandon, Manitoba. Albin enjoyed his retirement in Brandon being close to the sporting ac­ tivities. He passed away in September, 1980. Lilly still resides in Brandon. Rudolph Odin was born July 13, 1906. He attended high school in Erickson and Neepawa. He received a degree in Civil Engineering from the University of Manitoba. To help pay his way through university he worked on survey gangs for the summers. There were no student loans those days. 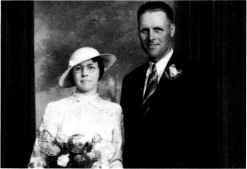 He worked near Kenora on the No.1 Highway and while there, met his future wife, May Fisher. They were married in June, 1937, and moved to Toronto. Rudolph passed away in 1979, and May still lives in Toronto. Rudolph and May had two children; Sandra and Michael. Sandra is a physiotherapist. She married Norfi Volpi and they have two children; Karen and Andrew. Michael is a Doctor in Children's Hospital. He and his wife Eileen have two children; Robbie and Kim. his discharge he returned to Flin Flon and worked there for some time. Hv moved to Western Canada and worked in logging and construction projects. Later, he moved back to Manitoba and worked as a carpenter. He married Elvie Hemmingson and they moved to Edmonton. He worked as a maintenance man in a hospital until his retirement. They have three children; Brad, Dennis and Penny and all are residing in Edmonton. Brad is a registered industrial accountant and married. They have three children. Dennis is in Real Estate, is married and has one child. Penny is a bus driver for the City of Ed­ monton and is single. Ludvig and Elvie have purchased a Condo in Penticton and plan to make their home there. Olga Sophia was born January 28, 1911. After finishing school she stayed home and helped with the household duties. In the early thirties she was asked to come to Winnipeg to do housework for Sam Baird's for four or five months. In 1938, Olga married Algot, youngest son of Erik and Elisabet Hall. (refer to Hall, Erik and Elisabet). Harold Rangvald was born on February 2, 1914, and took his education at Erickson School. He worked on his parents' farm until 1936, when he went to Flin Flon and worked as a Commercial Fisherman. He held various other jobs in the off season. In 1941, he became Assistant to R.J. McKenzie, Secretary-Treasurer of the Rural Municipality of Clanwilliam with a starting salary of $45.00 a month plus dinners at the McKenzie home. In 1946, he was appointed Secretary-Treasurer at $750.00 per annum and held that position until his retirement in 1979. When the Village of Erickson was incorporated in 1952, he also became its Secretary-Treasurer. In 1947, he was appointed Secretary-Treasurer of the Erickson School District No. 1366 and continued in this capacity until the formation of Rolling River School Division No. 39. With the above duties he also was an agent of the Motor Vehicle Branch and operated a General Insurance business which he sold to W.R. Piett in 1979. In 1948, he married Alma Scheibe, an Elementary Teacher from Ridgeville. They had two children; Eugene and Daidre, who both reside and work in the Insurance Business in Edmonton. Alma and Harold are members of the Erickson Lutheran Church and are happily retired in Erickson and taking part in many of the community organizations and activities. Richard Ingvald was born April 15, 1916. After completing high school in Erickson he began farming on his parents' farm which he operated until 1981. When he retired he rented the farm to his nephews Reg and Jim Nylen. He has been active in sports throughout his life as a participant, organizer and spectator. Richard managed the local hockey and baseball teams for several years. He also served locally on the board of Manitoba Pool Elevators and Erickson Credit Union. Following the death of his parents, he moved to Erickson where he lives with his widowed sister, Anna. Stella Irene was born August 12, 1920, the youngest member of the family. After completing high school in Erickson she stayed at home to help with the housework as her mother's health was not good. She taught school for one year at Nedrob. In 1947, she married Arthur Nylen. (refer to Nylen, Arthur and Stella).